I want to update the bios to the last relase with my SPI programmer (TL866 II plus). -Reading my UUID, Mac and serial with FD44Editor ----- NO ----> error message of FD44Editor : error parsing bios data motherboard S/N required but not found ----> According some forum post, FD44 doesn't work with laptop's motherboard . And AIO is equiped with a motherboard similard as a laptop. Problem (i think) : I have to merge the original BIOS and the new one of ASUS to preserve UUID, serial, Region and mac Adress. But how to if FD44 doesn't work ? So if FD44Editor don't open my dump, how to read and get the UUID, Mac adress and serial of that PC ? Please upload your BIOS dump, I will fix into new BIOS for you to use with programmer. .Cap file is not used with programmer, you must extract the body (Bin/rom) as you mentioned, but possibly download BIOS is only partial BIOS. That's why I want your initial backup dump, I will transfer board details manually. Yes, FD44 doesn't work with all BIOS, this is common issue. Sounds like your Intel ME is messed up, were you updating ME when this happened? If no, what caused the initial failure? (09-10-2018, 09:42 PM)Lost_N_BIOS Wrote: Please upload your BIOS dump, I will fix into new BIOS for you to use with programmer. .Cap file is not used with programmer, you must extract the body (Bin/rom) as you mentioned, but possibly download BIOS is only partial BIOS. That's why I want your initial backup dump, I will transfer board details manually. Yes, FD44 doesn't work with all BIOS, this is common issue. First of all many thanks for your help. Upload in progress, you will recieve the link by MP. Extract data of original bios and reinject it in the new one is very difficult ? What kind of software tool do you use ? Do you have any link for tutorials maybe ? 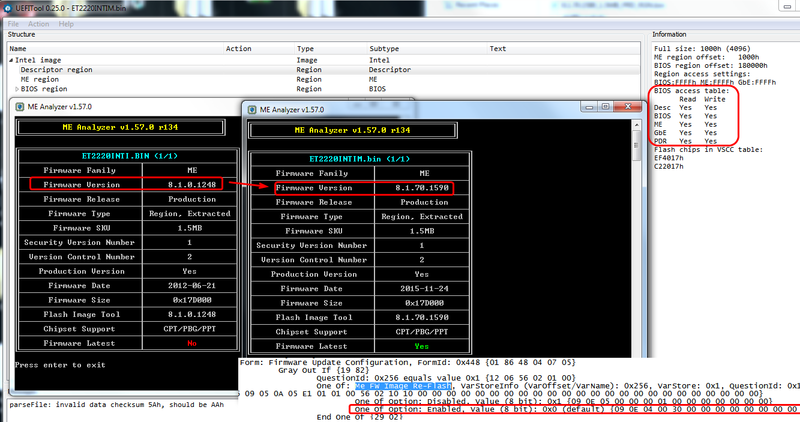 For the CAP yes, i have extracted the BIN Before With UEFI Tool , and compare the hex code with WinMerge. And more than only UUID, Serial, Region code and Mac Adress IMO. Probably Intel ME, Yes. I got the file. No, it's not difficult, but you have to be familiar with editing BIOS, hex editing, know where to look, what to look for etc. Cap is just 2KB at beginning of file, nothing else, for security purposes. And yes, often with some boards, ME is not part of the BIOS and Asus is known for that on certain models. What would be more helpful for you to compare is stock downloaded BIOS, after extract from capsule, compared to your programmer dump. There you would see some areas that may catch your eye. I checked stock BIOS with FD44 and it opens properly, so that means your backup should as well, so there is issue with either the backup or the BIOS itself is partially corrupted, likely part of the main issue you mentioned. What caused the initial problem, before you did anything with flash programmer? And do you have a backup of the BIOS from before that, or from when you first connected a programmer to it? Did this file you sent in PM, verify from your programmer (memory/buffer and chip match)? Since you have this system opened up right now, can you find the LAN MAC ID on a sticker? It will help me locate the other info. I'm having a hard time finding locations of board specific date in this BIOS, it's a little different than most probably due to being in AIO system. On the LAN MAC it's often this is on a sticker on the metal LAN block itself, or on the side of a PCI/PCIE slot, or side of 24 pin PSU connector, sometimes on SATA Block. Just look all around, any of the needed data could also be on any other stickers on the board. Please also post an image of any of the long white stickers you see too. All this, only if the below fails to help issue. For now, your board specific data may be OK still, unless you have programmed some stock or other dump to your board that wasn't from your board initially. I fixed and updated ME, see if this helps with the rebooting issue. Please be sure to erase the chip, blank check, then open file and write then verify.